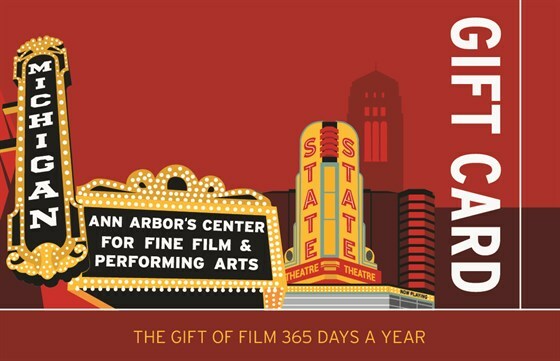 Give the gift of entertainment and cheer with a Michigan & State Theater gift card. The gift card has no expiration date and can be redeemed for any film or special event as well as for concessions and merchandise items. Great for friends, parents, co-workers, and anyone who might just need a night away...who knows, they might just let you tag along! Available at Guest Services only. E-certificates are available for purchase online. Fulfillment of online orders may be delayed because of the holidays. Please allow an additional 24 hours for fulfillment of all gift cards ordered online. If your purchase is time-sensitive, we recommend visiting Guest Services during regular business hours to purchase a gift card. PLEASE NOTE: Gift Cards are not redeemable for memberships. If you are interested in a Gift Membership, please contact Amber Duncan at aduncan@michtheater.org or 734.668.8397 ext. 28.